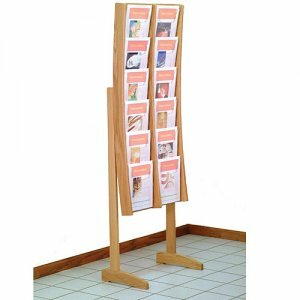 Stance Collection - 12 pocket contemporary oak curved floor display rack. This modern and stylish rack, with its curved solid oak sides, is sure to stand apart from the rest. Designed to hold your literature up straight without having corners of the paper curl over, the combination of clear corner supports and curved and tilted faces keep even light single sheet standing straight. The overlapping design allows for more pockets in a smaller space. These displays are constructed with solid oak sides and clear acrylic shelves. Each pockets measure 9" wide. Optional removable dividers are available to use when displaying 4" brochures. The removable dividers give you the versatility to display as many 4" brochures as you need, in which ever location you prefer, and they can easily be changed to adjust for your future needs. 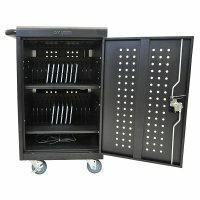 This rack is shipped in 2 boxes and is easily assembled with only four screws.